While its competitors are generally just focusing on selling motorcycles, Harley-Davidson emphasizes the selling of a lifestyle. Harley sells heavyweight luxury motorcycles designed for cruising on the highway. Harleys have distinctive retro designs inspired by classic H-D models, and a unique and immediately identifiable exhaust sound. The Harley-Davidson brand is best known for imagery, mystique, and experience. Harley-Davidson attracts a white collar following that lives second lives as bikers, allocating considerable amounts of time and disposable income into their Harleys. Currently, the average Harley customer is an upper-class 47 year-old white male with an annual income of around $80,000, and pays roughly $16,000 for their motorcycle. The average age of H-D customers has been increasing by six months every year for the last twenty years, and average income has more than doubled over that same time period. Harley-Davidson currently has five different model families in its brand portfolio: Touring, Softail, Dyna, Sportster, and VRSC. The frames, engines, suspension, and other characteristics distinguish the model families. The Touring family includes several Road King and Electra Glide models. The Road Kings have a distinct retro look borrowed from H-D models of the 1940’s and 1950’s. Electra Glides have several distinct features as well, including their full front fairings. The Softail family is known for its independent rear wheel suspension, which is hidden under the transmission. It has a similar look to popular “Hardtail” motorcycles from the 1960’s and 1970’s. The Dyna family features big twin engines and traditional styling. They have larger engines and different suspension than other model families. The Sportster family features Harley's lightest and fastest motorcycles. This model family is best equipped for high speeds and tight cornering. The VRSC family looks very different from the other model families offered by Harley-Davidson. The VRSC family is Harley’s answer to Japanese and American racing motorcycles that have been gaining popularity, and for that reason does not have a traditional look to it. The VRSC family is also Harley-Davidson's newest established model family. Harley-Davidson is the largest manufacturer of heavyweight motorcycles in the world by market share, capturing half of the market in the United States and one-third of the global market. The company generates 70% of its sales within the United States, and 30% internationally. Europe accounts for half of its international sales. Harleys are considered luxury goods, and the company competes primarily on design and perceived quality rather than price. Margins are high for Harley-Davidson relative to other motorcycle manufacturers; their gross margin was 31% in 2009. Revenues in 2009 were $4.29 billion, and motorcycle sales totaled 223,023 units. 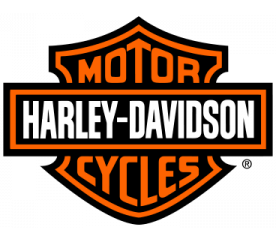 Harley-Davidson motorcycles are sold exclusively through authorized Harley dealers. These dealers sell motorcycles directly, sell motorcycle parts and accessories, operate retail motorcycle dealerships, sell motorcycle gear and general merchandise, and offer loans to buyers. The application process for becoming an authorized H-D dealer is rigorous, and standards are set extremely high. In order to meet the minimum requirements, the applicant’s net worth must total $2.0 million or more in aggregate, and the amount of liquid assets for all investors must total $1.0 million or more in aggregate. Harley-Davidson competes almost exclusively in the heavyweight motorcycle market. This market appeals largely to older buyers seeking style, quality, and status. Harley held 50% of the market share in the United States as of 2007. However, the company faces major competition from Japanese manufacturers in the heavyweight motorcycle market. Harley competes directly with Honda, Suzuki, Yamaha, and Kawasaki. However, Harley competes to some degree with all other motorcycle manufacturers as well. The aforementioned Japanese companies hold the majority of the market share in the lightweight motorcycle market, a market that Harley has yet to successfully penetrate. Lightweight motorcycles appeal to younger buyers seeking speed, agility, and affordability. Harley's VRSC model family competes in the lightweight motorcycle market, but has had little success taking market share from its Japanese competitors, which offer higher performance lightweight motorcycles at significantly lower prices. For decades, Harley-Davidson has thrived in the heavyweight motorcycle market, which makes up more than 80% of the company's sales. However, this market is most popular with the aging Baby Boomer generation. Heavyweight motorcycles generally do not appeal to the younger generations who are reaching their financial prime. Younger generations favor the faster, smaller, and cheaper lightweight motorcycles offered by Japanese companies. Harley-Davidson’s primary competitors are much larger and more diversified companies. For instance, Honda has the second most market share in the heavyweight motorcycle market, yet that facet of Honda makes up only 12% of Honda’s total revenue. Harley is a much more specialized company, with motorcycle sales making up the vast majority of its total revenue. The remainder of its revenue comes from financial services, retail sales, general merchandise, parts, and accessories. All of these revenue streams are related to Harley’s flagship motorcycle products. As a result, Harley’s financial resources are miniscule relative to its competition, which affects research and development, marketing, distribution, and all other facets of the business. Harley-Davidson also faces competition from custom chopper producers, which have become extremely popular in recent years due to exposure from television shows such as American Chopper and Orange County Choppers. These custom built motorcycles are an increasing threat to Harley-Davidson in the heavyweight motorcycle market.